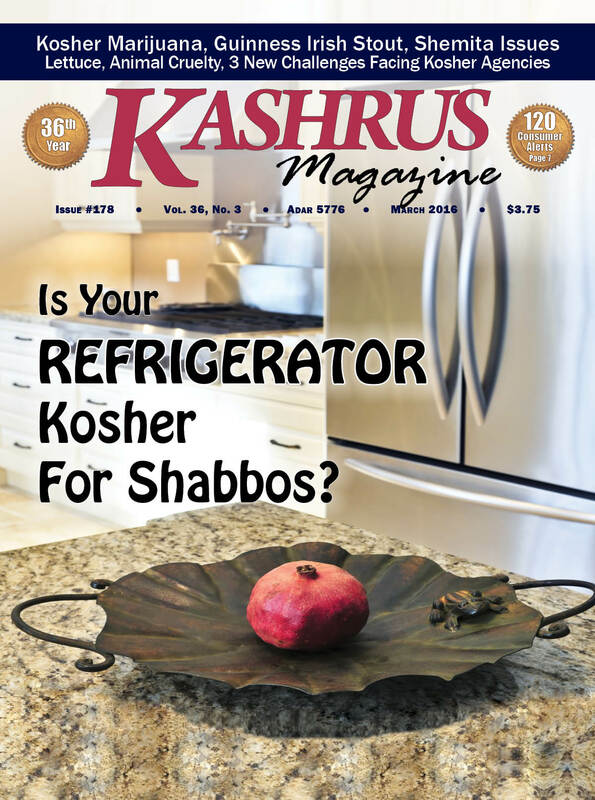 Is Your Refrigerator Kosher For Shabbos? The vast majority of people accept the ruling of many rabbis that a refrigerator can be used without paying attention to the thermostat and without fear that opening and closing the door will cause the compressor to be turned on or to stay on for a longer time. This approach has a firm halachic basis (although there are stricter opinions too). Based on this approach, no-frost refrigerators, both new and old models, do not present any problem. These refrigerators have a tiny heating element for thawing ice which is controlled by the thermostat (similar to the defrost wires in a car), but this element does not glow and is therefore not bound by the halachic restriction of “burning” (except for some very specific models). All this was until recently. Today, most modern refrigerators have fans in the freezer and in the main refrigerator compartment to guarantee an even distribution of cold air. When the door is opened the fan goes off (giving a marginal energy saving by decreasing the loss of cold air to the outside). This is typically controlled by a mechanical switch linked to the opening of the door. This switch is usually quite easy to locate. Technicians can determine if a specific model has a fan or not (most modern refrigerators do). If so, it can be jammed open with a small object that applies constant pressure to it, or it can be covered with masking tape before Shabbos. Many manufacturers supply a standard cover for this switch. “Digital” refrigerators are not recommended for use! They have a minicomputer. Opening the door starts a timer that sounds a buzzer if the door is not closed within two minutes. They also often have an electronic display which is directly influenced by the opening of the door. Disconnecting the display or any other signal light or buzzer does not solve the problem of the electronic mechanism, which continues to send the information to the computer whether the buzzer sounds or not. In most cases, the element that senses the door position is the same switch which controls the fans and also turns the light on or off. If this is true, it is possible to jam the switch for Shabbos (with a small object or with masking tape) and thus to “fool” the refrigerator into ignoring whether the door is actually open or not. This also solves the problem of digital control. However, in some models, the computer receives its own independent information about the status of the door from another sensor, often a magnetic detector which closes a switch when the door is opened and is not visible from the outside. (It is usually on the inside of the doorpost). In this case, jamming the switch on the door will not solve the problem! Some companies provide an external magnet that can be placed on the outside next to the doorpost, opposite the internal magnetic sensor. This "fools" the sensor into acting as if the door is still closed. But, not all companies provide this service, and technicians often refuse to disclose full information about this subject. We, therefore, recommend not buying a digital refrigerator unless it can be determined in advance that it is suitable for use on Shabbos. Some people are very strict and will not open the door of a refrigerator while it is not working, fearing that to do so will cause the thermostat to turn the compressor on immediately. In order to provide a solution for those who want to take this into account, companies in Israel have developed a “mehadrin Shabbat mechanism.” In some cases, this is a setting that disconnects the thermostat, so that the compressor remains on all the time (except during defrosting). Such a mechanism is liable to cause icing in the freezer and interfere with the proper operation of the refrigerator. Other companies have developed a special Shabbat control that replaces the thermostat with a fixed on-off cycle. (1) When buying a refrigerator, it is important to make sure that the service company is willing to provide special mechanisms for the switches on the doors (both the refrigerator and the freezer). (2) Digital refrigerators should not be bought unless one can be sure that all of the door-related sensors can be disconnected on Shabbos. Keeping Your Cool, by Rabbi Avrohom Mushell (www.Star-K.org). Refrigerators and Freezers on the Shabbat, edited by Eliyahu Braverman (chashmal052@gmail.com); translated from the Hebrew by Aryeh Teichholz (rlt@okmail.co.il). Refrigerators on Shabbat, Zomet Institute (www.zomet.org.il). Mishmeres Hashabbos can be contacted at 011-972-72-216-4422, by fax at 011-972-72-216-4423, or by email at a0722164422@gmail.com. A Supco Shabbos clock is available @ $100 in some electrical stores. A Hetken can be installed for about $300 in New York and New Jersey by contacting Mehadrin Wireless, 732-320-6929 or mehadrinw@yeshivanet.com. Let’s face it, it’s not easy giving kosher certification. Beyond what every kosher consumer knows occupies the time of the rav hamachshir — the business side and the kashrus side of kosher supervision — the rav hamachshir has countless incidents like the following with which he has to deal. We can only point out a few. The integrity of the person in charge of a kosher-certified company must be intact. What happens when a company head has been convicted of a crime? Does the kind of crime matter? What if he has only been tried or is currently being investigated? When and how does a person lose his chezkas hakashrus, his respectability as a reliable Jew? Recently, I was asked to weigh in on a case where a caterer had been brought before a beis din and then he completely refused to follow the determination of beis din, even though he had signed a paper at the start that he would. I was asked whether I thought that the caterer’s certification should be removed. I issued the following letter. It is my personal position, as well as that of KASHRUS Magazine, that, if a kosher-certified company has a valid siruv or lo tzayit l’dina against it from a recognized beis din, the certifying kashrus agency should privately suspend their kosher certification, although not announce it anywhere, and give the company ample time to reach a conclusion with the litigants. If the appointed time arrives and they have not worked out a proper manner for resolving the dispute, then the kashrus agency should remove their certification completely and announce it to the public. During the time of “suspension,” everything will continue as usual — visitations and payments — but the company will realize that this is a serious situation. With so many examples of shomer Shabbos people cheating on kashrus, especially in meat businesses, it behooves the kashrus agency to properly respond when an owner exhibits a lackadaisical attitude to halacha and to bein adam l’chaveiro (matters between people). It may be indicative of his willingness to compromise on the halachos of kashrus. A flagrant violation of the respect for beis din that the Torah requires is a sign that the individual will not follow rabbinic requests in the kashrus arena. In addition to sending this letter to those handling this particular case, I took the opportunity to send it around to some in the kashrus field. It was interesting to learn that many kashrus agencies had had experiences in handling related matters. In fact, some agencies do have a clause in their contract that gives them the right to terminate the contract if the company or any of its officers were convicted of a crime or committed a serious violation of health or sanitary codes. What is stickier, though, is determining whether these beis din issues are similar to criminal activity. Unlike the court system in the U.S., some batei din are ad hoc, rather then functioning as a fixed, sitting beis din and not all batei din enjoy the same reputation. But, the seruv and lo tzayit l’dina should be taken very seriously. To read the rest of this article, click "Buy this issue now" or "Subscribe" at the bottom of this page. Martin Mendelsohn, an observant Jew, passed away at the age of 69, on the second day of Rosh Hashanah 5776/2015. He served as an accountant for the City of New York. Since 2004, Mr. Mendelsohn was a resident-patient at the Evergreen Court home for Adults in Spring Valley, NY. Evergreen is an assisted-living, kosher residential facility for adults with physical or mental disabilities which offers Shabbos and yom tov minyanim amongst its full spectrum of religious services. Upon entry, Martin indicated his preference for participation in all religious services such as minyanim and Pesach sedarim and contributed to ensure that a master chazzan led prayer services. This past Rosh Hashanah, Martin did not feel well and thought he would be unable to attend services. He specifically requested to have a rabbi blow a shofar at his bedside. On the first day of Rosh Hashanah, one day before he died, a weakened Martin exerted energy to attend services and to hear the shofar being blown. Martin was never married and is survived by his only brother, Steven Mendelsohn, a lawyer in California. Steven was designated in Martin’s papers as the person to make all necessary burial arrangements. After Martin passed away, his body was routinely transferred to Hellman Memorial Chapels and his brother was contacted for burial instructions. Chesky Schonberger, owner of Evergreen, advised the funeral home that Martin was an observant Jew and that Orthodox Jewish traditions should be maintained. Martin’s brother Steven, however, had instructed the funeral home to have the body cremated and to have the remains (the ashes) shipped to California. Chesky immediately called Steven and promoted the idea that, in keeping with Martin’s lifestyle preferences, a traditional burial was warranted. When Steven declined and insisted that the body be cremated, Chesky offered to pay all costs, including the full cost of having Martin transferred to California to be buried there.